Who wouldn't want a plate of that? Recently, we decided to have a handful of friends over for some barbecue and an easy hangout. As it is, in fact, a million degrees outside, the goal was to put together a menu that would not require slaving away in a hot kitchen all day. Being an advocate of simple, casual get-togethers, I have detailed some tips and tricks for throwing the perfect casual gathering. One aspect of our style of entertaining is... it includes a lot of beverages. This typically includes sharing beer tastes (we run with a craft beer-loving crowd), wine and/or a cocktail that can be made in large batches. Also, copious amounts of water. More on that momentarily. This little sideboard is actually a makeshift piece of party furniture. Spoilers: it is an old Ikea media console covered in a cute red tablecloth. It came out for a dinner party, and has been so useful that it lives in our dining room until we find a 'real' sideboard alternative. 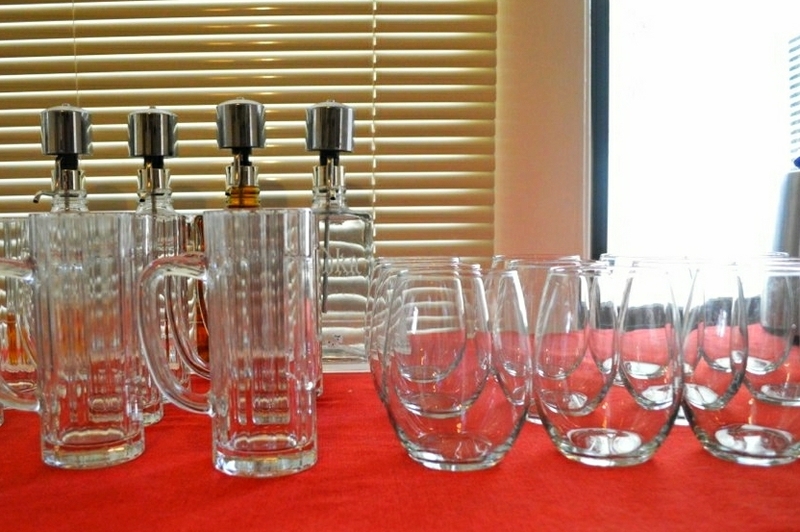 It is convenient to have something set aside purely for a party, on which you can set food, drink or, in this case, glasses, without crowding up your dining room or coffee table. The glasses are ones I got in bulk. The steins are from a family friend and have a flat side where guests can write their names with whiteboard markers (if you aren't too lazy to find a whiteboard marker, as we often are). The stemless wine glasses are perhaps my favorite entertaining coup, being $1 each from Dollar Tree. Having these out and ready for self-service really opens up your time. 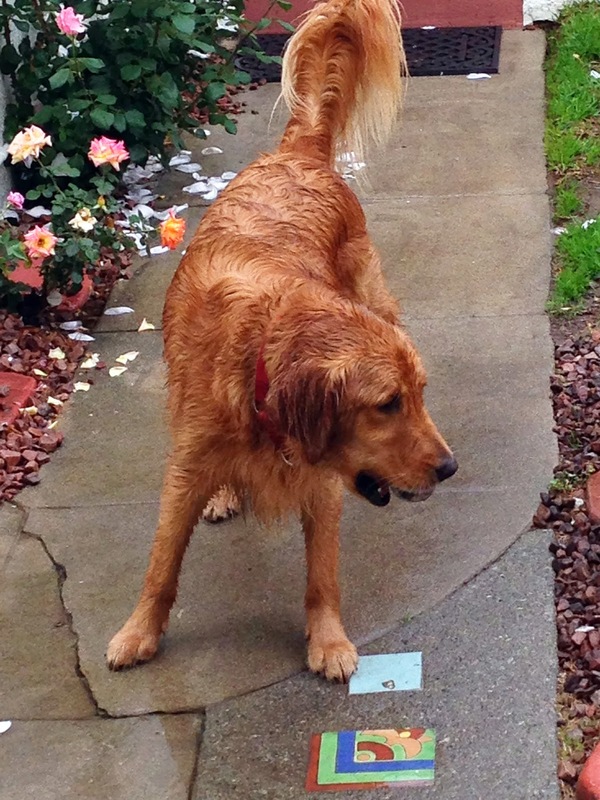 First, the water. I like to make sure that there is always a pitcher of water filled, namely because of the aforementioned Summer heat. This party marked the first appearance of the ice bucket, which turned out to be quite useful. I was really impressed with how long the ice stayed solid in there, and only had to be refilled once. This was a cheap find at TJ Maxx that my mom gifted us, and likely won't run you more than $10 or $15. 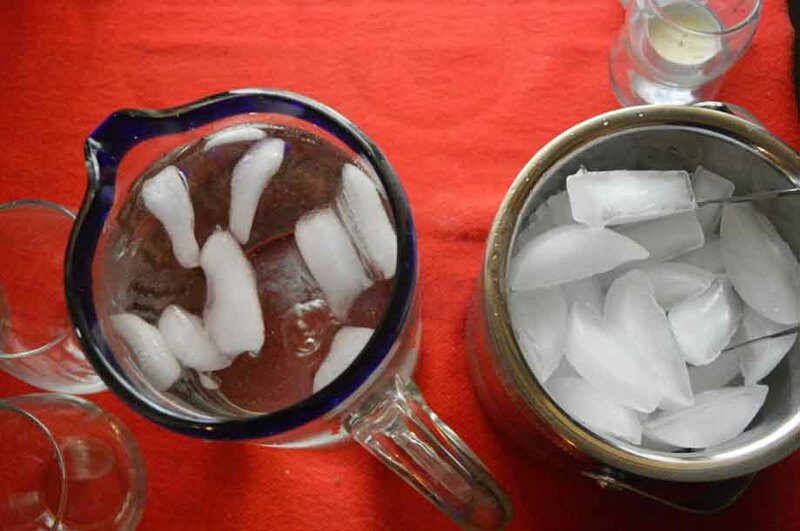 Periodically, I would refill the water pitcher and add more of the ice cubes to make sure it stayed chilled. Imagination exercise: picture a pitcher filled with lemonade above, as if I had remembered to take a photograph of it. This mythical pitcher was filled with mint lemonade I had made that morning. The base recipe is quite easy, and I simply muddled some mint and tossed it into the lemonade to chill a couple hours and add a minty flavor. This served double-duty as a non-alcoholic option, as well as a cocktail alternative to beer. By putting out some vodka and bourbon, this gave guests the option to spike lemonade if they felt so inclined. Typically, I like to use real plates and some inexpensive, bulk black cloth napkins I bought on Amazon, but this is barbecue. The day before, I went through over ten paper towels eating half a pulled pork sandwich. 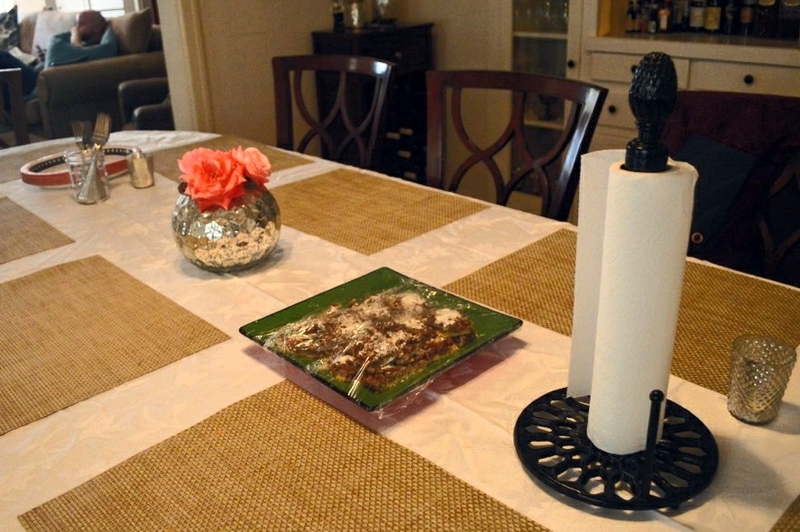 Let's be real, paper towels are the way to go. Also, while I don't follow the classic "every party needs a flower arrangement!!" rule of thumb, I do think they are nice and pretty if you feel like indulging. We just snipped some roses from our yard and put them in this vase for some color. Oh, fork it. Let's just eat. 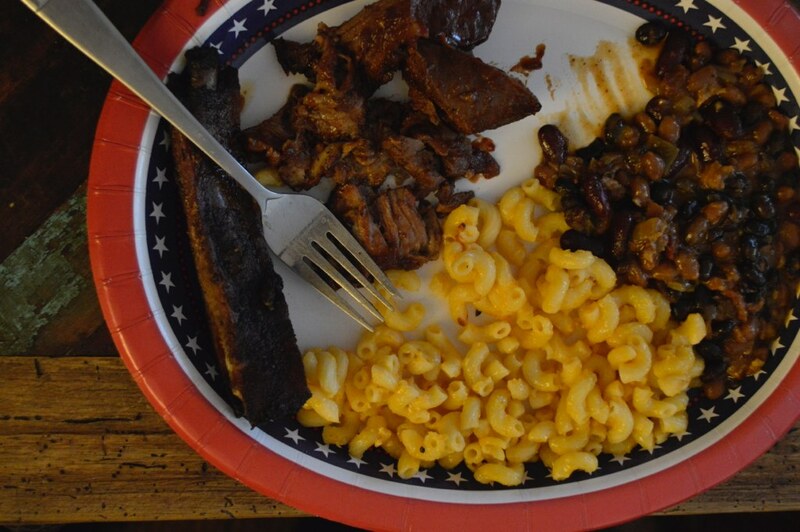 I believe that barbecue also calls for paper plates, roughly three per person if you want to factor in the inevitable repeat visits to the food. Costco almost always has some variation of a hearty, holiday-themed individual-sized paper platter. Being a few weeks away from the 4th of July, an American flag design it is. Paired with the barbecue, let's just say it added an air of patriotism to the occasion. 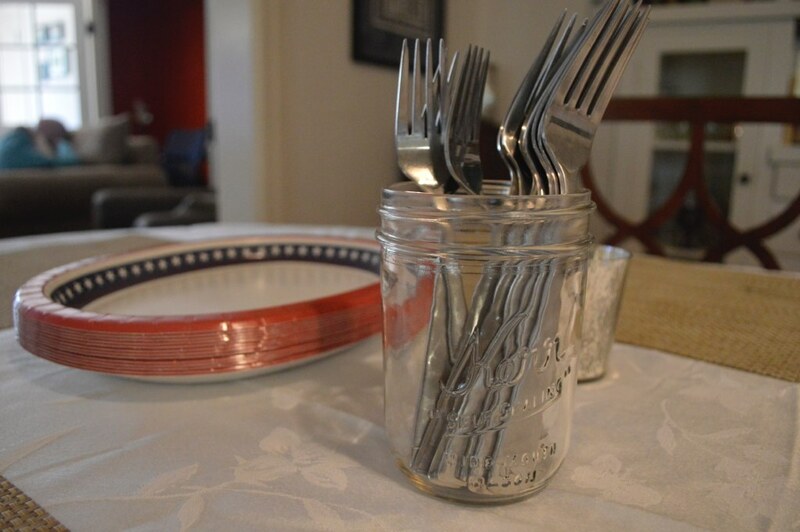 The silverware I tossed in a wide-mouthed mason jar glass so people can grab them easily. "I want to eat the meat!" The food was all about comfort food. 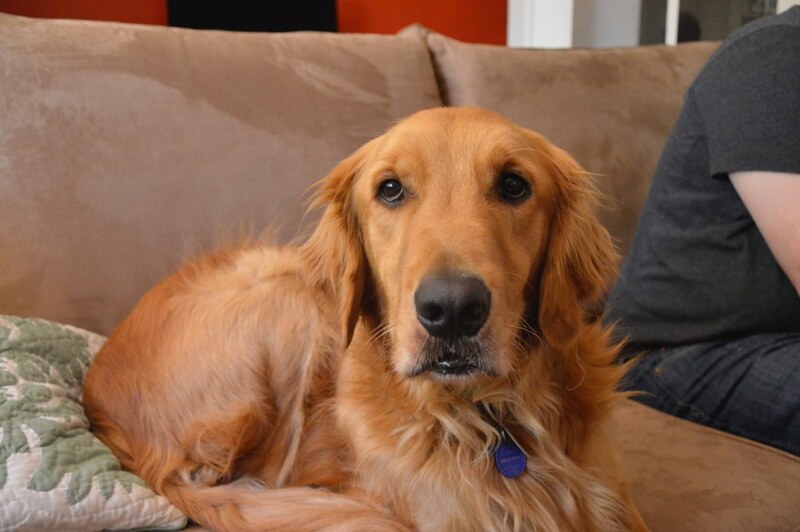 No, we didn't eat the dog (as the photo above might suggest). Our good friends Christie and Adam (purveyors of all things delicious) introduced us to Bludso's BBQ, a delicious little hole-in-the-wall in the heart of Compton. We picked up an obscene amount of meat and planned to make the sides ourselves, excepting the big batch of beans the same two friends brought us from Gus's Barbecue (aka: the South Pasadena rival of Bludso's for our meat-loving hearts). 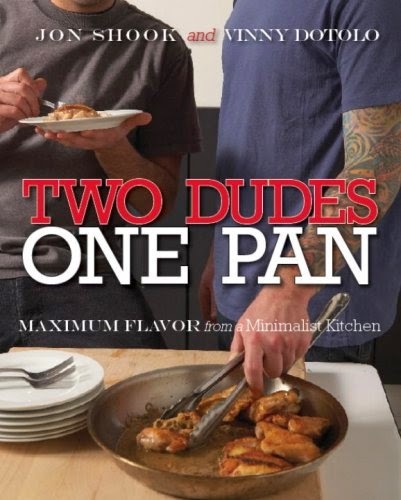 As I have previously mentioned, the Two Dudes, One Pan cookbook is one of my absolute favorites. Their recipes are simple, foolproof and unique. 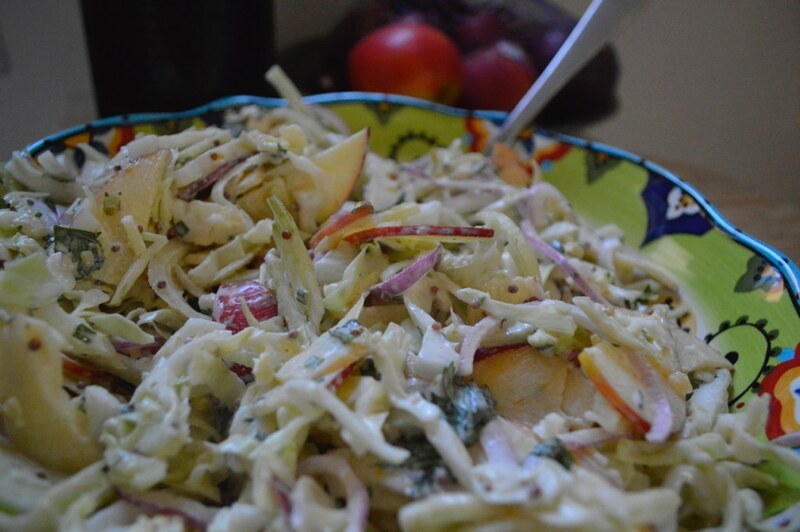 Their Apple Fennel Slaw recipe is utterly divine. We omitted the jalapenos this time as we wanted it to cool down the meat, but typically we like it nice and spicy. I highly recommend Ree Drummond's recipe for some down home, cheesy comfort. Word to the wise, the six servings she mentions are HEARTY six servings. This made an enormous pot of mac and cheese, which we proceeded to graze on for hours. I chose this recipe because each step of it included bourbon and, well, that is pretty awesome. Admittedly it didn't yield pecan bars as flavorful as I like them to be, but a sprinkle of brown sugar or sea salt perked those right up. ...and there you have it! What are your secrets for a quick-and-easy Summer party?! This one is an easy one, theoretically. If you have people coming over, you want to be lovely, fresh-faced and looking your best. You also want to ensure you have everything ready to go by the time everyone arrives. Almost every time I have a party, I succumb to the siren song of waking up, running to the kitchen and cooking. Or putting up decorations. Or making a playlist. Then my first guests arrive, typically good friends, so naturally I start chatting. Then everyone has arrived. Not only will I have not showered in at least a day, but there is inevitably a host of three or more ingredients splattered all over me (we're talking flour matted into hair). So what is the streamlined tip of the day? Shower. When. You. Wake. Up. Sometimes taking getting clean is rough, man. Or shower when you get home, in the case of weeknight gatherings. Whenever you first start to enter "party mode," jump in the shower, get a cute outfit on, don an even cuter apron over it for kicks (trust me, you'll look adorable) and eliminate all that stress at once. Heck, you can even mix the sangria while your hair dries. 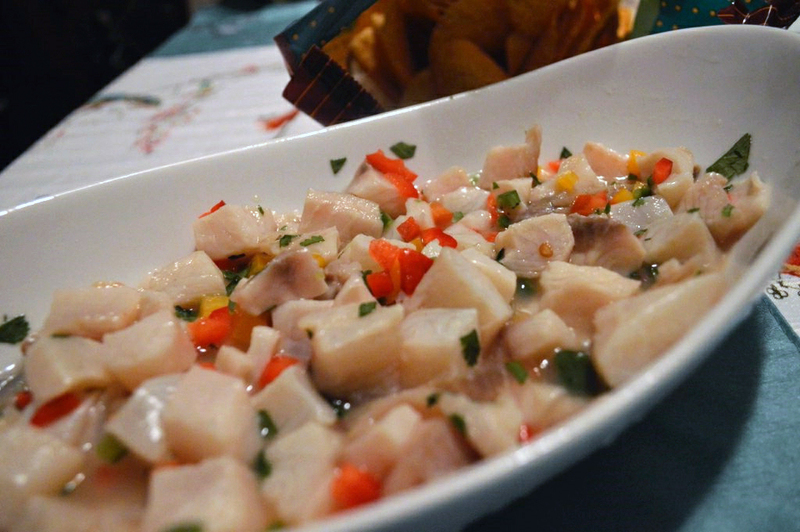 Once upon a time, I was very intimidated by ceviche. 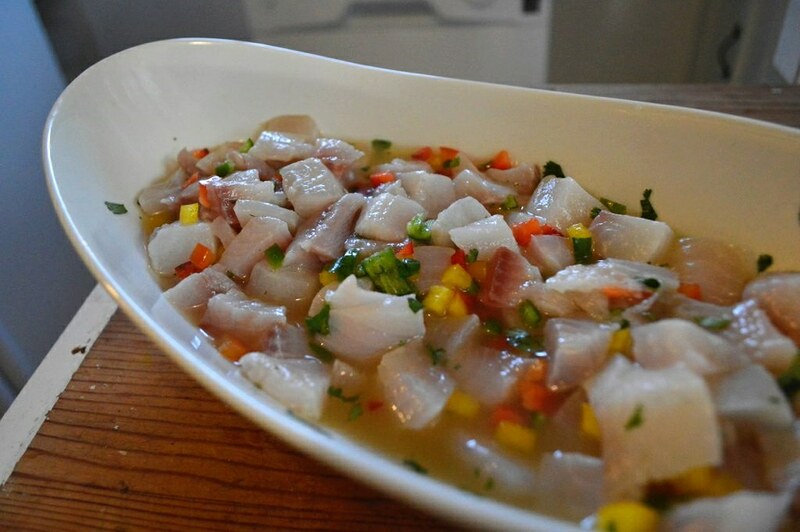 For those unfamiliar, ceviche is a dish comprised of small pieces of raw fish, 'cooked' in citrus juices and seasoned with peppers, cilantro, or a plethora of other options. The 'cooking' in citrus juice factor is what daunted me the most. Sure, science and every other place that serves ceviche says that it is cooked, but what if I poison my friends by accidentally serving raw fish that isn't sushi-grade? Well, that was until I went to Mexico on my honeymoon and was positively spoiled by the delicious ceviche made available. Upon arriving home, I wanted more. ASAP. Fortunately, Vinny Dotolo and Jon Shook (prolific restaurateurs in Los Angeles) have the best cookbook on our shelves (heck, probably anyone's shelves) that includes a delicious recipe. This book is Two Dudes, One Pan: Maximum Flavor from a Minimalist Kitchen, and you should open a new tab and buy it immediately. Really. I'll wait. OK, welcome back! You won't regret it. Back to my initial ceviche-at-home aversion. In essence, I just make sure to get good quality fish from the fancy grocery store (Bristol Farms, in our case) for my peace of mind. Don't get the manager's special 'probably still good' fish for this one. Prepped and ready to set in the fridge. This dish also feels very decadent, while really being extremely simple. The hardest part is making sure to plan an hour to several hours ahead, so the fish has time to marinate. In the times I have made this, we have typically had leftovers. The next day was often even better than the first. 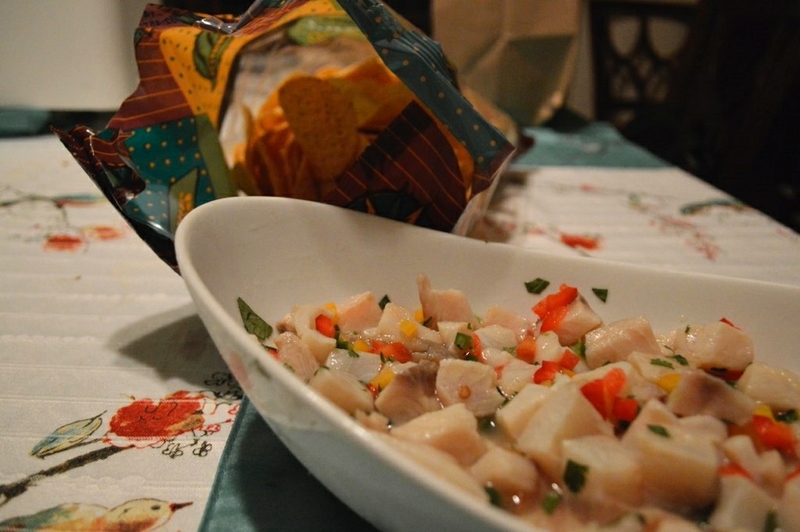 Sure, I wouldn't push it any more than 24 hours for aforementioned paranoid reasons, but, until then, you can get your hands on some damn fine ceviche. Served with tortilla chips, this also makes an excellent appetizer for a party. It is fresh-tasting, bright with the citrus and peppers and stretches amongst a large group of people as folks are far less likely to destroy a dish of fish than, let's say, shoveling in hummus. Substitutions and Adjustments: This recipe calls for fluke, group, or halibut but, considering our fancy grocery store didn't have fluke or group and halibut was $33 a pound (a little rich for my blood), the fishmonger suggested tilapia. This came in at about $13 a pound, and turned out great. This can also stretch to feed about 8, if served as an appetizer. Finally, I substituted tortilla chips for popcorn or corn nuts. Whisk the lemon, lime, and orange juices together in a large bowl. Add the jalapeño, bell peppers, cilantro, sugar, and salt and whisk to combine. Add the fish and toss gently with your hands. Cover the bowl with plastic wrap and marinate in the refrigerator for 1 to 2 hours. Serve in bowls with popcorn or corn nuts on the side. Adding arugula on top essentially makes it a salad. Let's just go with "Quesa-pizza." I had a friend swing by randomly the other day, and I had nothing to eat. Well, nothing that wasn't part of my Freezer Binge Cooking Day. So, if you are looking for a quick-and-easy snack for your impromptu guests that isn't tortilla chips and old salsa, I recommend this quick fix. It has the casual, cheese-laden hint of college "cooking" that pairs nicely with daytime beer. Plus, isn't anything made better when you sassily turn it into a pizza? In the past we've put palak paneer on a pizza and broiled it so it got nice and melty (palak paneerza, anyone?). We also cooked up some Trader Joe's marinated Bool Kogi and put that on a pizza along with mozzarella and kimchi. Fusion is so hip right now. This time, as I had some leftover "Italian" ingredients, I went for favorite pizza toppings on my lazy woman's pizza crust (:cough: tortilla). 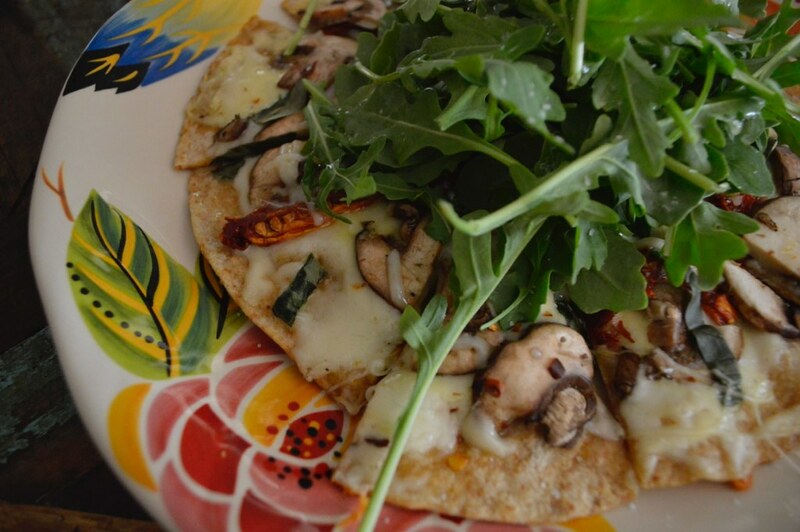 Start by laying out your tortillas on your work surface and sprinkling each with almost half of the cheese. Set a little cheese aside for later, about a couple tablespoons. Spread half of the mushrooms, then sprinkle half of the sun-dired tomatoes across each. 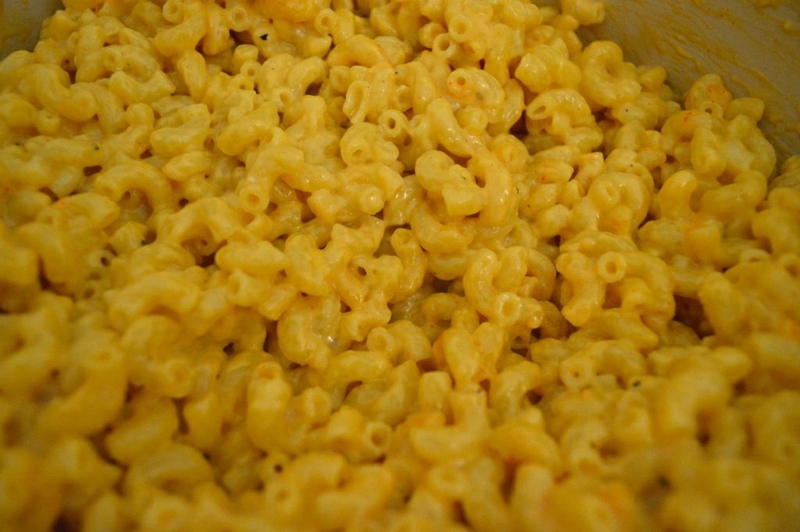 Sprinkle the small amount of cheese you set aside on top. No practical purpose for this, just that cheese on top looks more alluring. Heat a griddle up over medium-high heat and rub a small pad of butter over it. Put the pre-assembled tortillas on the griddle until the cheese on the tortilla starts to melt. If you are overly hungry, as in my case, cover with a pot lid for a melting catalyst. This also works if you don't have a griddle, just heat up two skillets. Once the cheese melts, place on the plate you are going to serve on. Cut into desired segments. Use your high school geometry here, as I am pretty sure this is the only context in which I have. 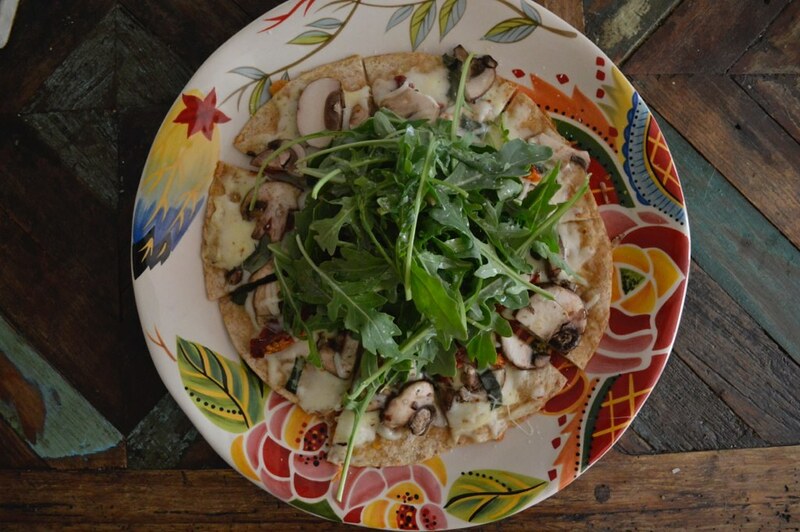 Place a heaping cup of arugula in the middle and add lemon juice, olive oil, red pepper flakes, salt and pepper on top of the arugula to taste. Viola! What is your favorite quick-fix snack?